Cincinnati Financial Corporation (NASDAQ:CINF) investors should pay attention to an increase in enthusiasm from smart money of late. CINF was in 22 hedge funds’ portfolios at the end of December. There were 11 hedge funds in our database with CINF positions at the end of the previous quarter. 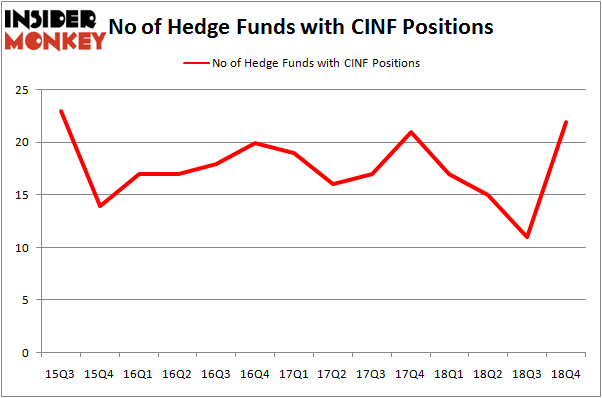 Our calculations also showed that CINF isn’t among the 30 most popular stocks among hedge funds. Let’s analyze the recent hedge fund action surrounding Cincinnati Financial Corporation (NASDAQ:CINF). How are hedge funds trading Cincinnati Financial Corporation (NASDAQ:CINF)? At the end of the fourth quarter, a total of 22 of the hedge funds tracked by Insider Monkey were long this stock, a change of 100% from one quarter earlier. Below, you can check out the change in hedge fund sentiment towards CINF over the last 14 quarters. With hedgies’ positions undergoing their usual ebb and flow, there exists a few noteworthy hedge fund managers who were increasing their stakes meaningfully (or already accumulated large positions). Among these funds, Select Equity Group held the most valuable stake in Cincinnati Financial Corporation (NASDAQ:CINF), which was worth $459.5 million at the end of the third quarter. On the second spot was Fisher Asset Management which amassed $9.7 million worth of shares. Moreover, Prospector Partners, Renaissance Technologies, and Ancora Advisors were also bullish on Cincinnati Financial Corporation (NASDAQ:CINF), allocating a large percentage of their portfolios to this stock. Consequently, some big names have been driving this bullishness. Cognios Capital, managed by John Brandmeyer, initiated the most outsized position in Cincinnati Financial Corporation (NASDAQ:CINF). Cognios Capital had $2 million invested in the company at the end of the quarter. 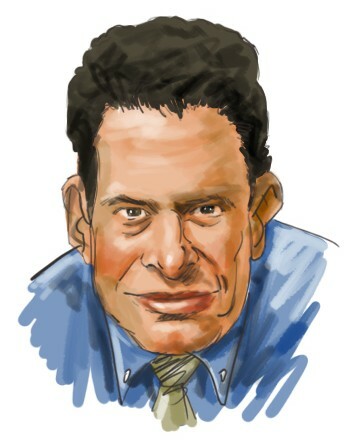 Israel Englander’s Millennium Management also initiated a $2 million position during the quarter. The following funds were also among the new CINF investors: Ray Dalio’s Bridgewater Associates, Jeffrey Talpins’s Element Capital Management, and Brandon Haley’s Holocene Advisors. Let’s now take a look at hedge fund activity in other stocks similar to Cincinnati Financial Corporation (NASDAQ:CINF). These stocks are Synopsys, Inc. (NASDAQ:SNPS), Tenaris S.A. (NYSE:TS), The Cooper Companies, Inc. (NYSE:COO), and Principal Financial Group Inc (NASDAQ:PFG). This group of stocks’ market valuations are closest to CINF’s market valuation. As you can see these stocks had an average of 21.5 hedge funds with bullish positions and the average amount invested in these stocks was $666 million. That figure was $530 million in CINF’s case. Synopsys, Inc. (NASDAQ:SNPS) is the most popular stock in this table. On the other hand Tenaris S.A. (NYSE:TS) is the least popular one with only 13 bullish hedge fund positions. Cincinnati Financial Corporation (NASDAQ:CINF) is not the most popular stock in this group but hedge fund interest is still above average. This is a slightly positive signal but we’d rather spend our time researching stocks that hedge funds are piling on. Our calculations showed that top 15 most popular stocks among hedge funds returned 19.7% through March 15th and outperformed the S&P 500 ETF (SPY) by 6.6 percentage points. Unfortunately CINF wasn’t in this group. Hedge funds that bet on CINF were disappointed as the stock returned 10.6% and underperformed the market. If you are interested in investing in large cap stocks, you should check out the top 15 hedge fund stocks as 13 of these outperformed the market. Here’s What Hedge Funds Think About ABIOMED, Inc. (ABMD) Here is What Hedge Funds Think About American Airlines Group Inc (AAL) Did Hedge Funds Drop The Ball On Plains All American Pipeline, L.P. (PAA) ? Here’s What Hedge Funds Think About Total System Services, Inc. (TSS) Here’s What Hedge Funds Think About Cheniere Energy, Inc. (LNG) Did Hedge Funds Drop The Ball On Markel Corporation (MKL) ?